Although music plays an important part in bandstand history, not all bandstands are music-themed, except in their common gazebo-type look. In today's post, we'll look at bandstands that visually pay tribute to their musical history. 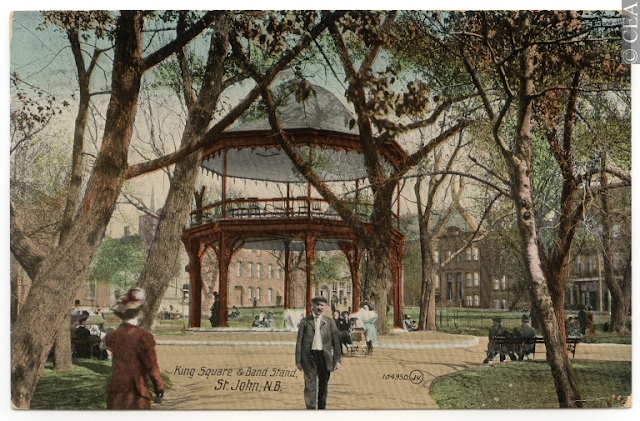 The above postcard shows a unique 2-tier structure donated to the city of Saint John, New Brunswick, by the Saint John Cornet Band in 1908. To honor the musical heritage of the bandstand, they also donated a real cornet which was placed at the apex of the roof. A half century later, a fountain was installed at ground level which added to its uniqueness. In 1986 however, the City Cornet Band dissolved after 139 years of activity and silence settled over the structure. Skip forward to 2013 when two community members step forward with a gift of $100,000 to refurbish and revitalize the old bandstand. "King's Square is a key link to our past and a vital part of our future," the mayor said as his council passed a resolution to accept the donation. 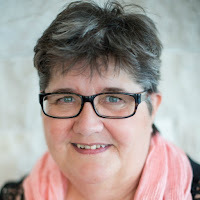 "The bandstand was a generous gift from the City Coronet Band and thanks to this generous gift, this icon of the city will once again be a source of entertainment and culture in the heart of our uptown." Today, the sound of splashing water from the fountain mingles with the music flowing from the top level of the elegant King Edward VII Memorial Bandstand, the only structure in Canada to honor this monarch. One of the first bandstands to be built in Minneapolis, Minnesota, was set in Loring Park on land bought for a public park in 1883. With its growth, along with other city parks, it became a prominent place for musical, as well as theatrical performances. 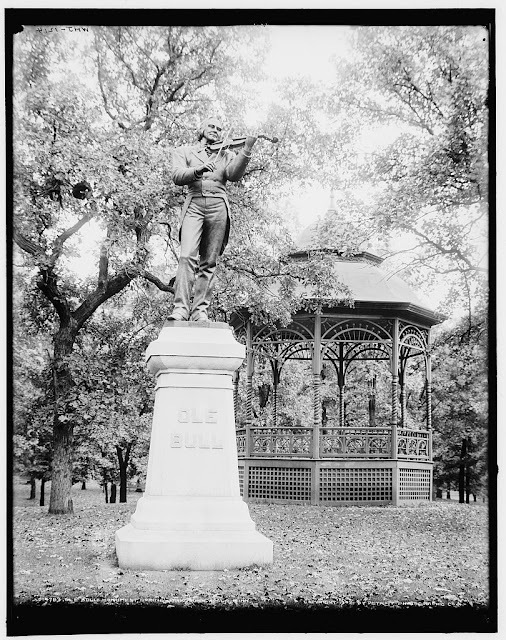 In 1897, Norwegian immigrants of Minnesota erected a statue to honor esteemed violinist and composer, Ole Bull, who had been the catalyst for many of them to leave their old country for a new one. For years, the statue was the gathering place for Norwegians celebrating their homeland's independence day, as well as a fit setting for fiddling contests. Loring Park was very successful as the site of the dramatic performances and in 1911 offered a historical play that attracted an estimated 25,000 attendees for each performance over three nights. In 1951, with the popularity of mass singing competitions, Loring Park erected a new bandstand. As the competitions faded in popularity, concerts and movies continued to draw in the crowds. Although more recent photos of the area don't show anything except greenery behind the statue of Ole Bull, it still stands as a testament to the Norwegians who helped build Minnesota, as well as the state's appreciation for the arts. 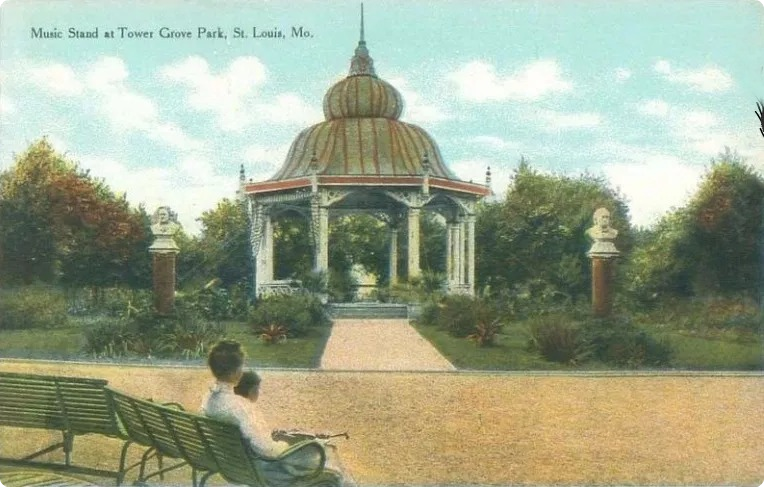 Tower Grove Park in Saint Louis, Missouri, is the site of several statues and pavilions, including the music stand, a large Victorian bandstand erected in the 19th century and representative of what you would find in a Victorian walking park. Officially registered on the National Register of Historic Places (NRHP), Tower Grove Park Music Stand was built in 1872 and is surrounded by pillars bearing the white marble busts of six famous musical composers. The Music Stand has been stabilized with guy wires for many years. It's original purpose was to give free concerts on Sunday afternoons, and it continues to this day by hosting ten Compton Heights Concert Band performances each summer. The Music Stand is also a favorite place for events, such as weddings, provided the rules concerning food, drink, and decorating materials are strictly observed in order to preserve its historic beauty. When the bandstand at Tower Grove Park was nominated for the NRHP in 1987 it listed its colors as brown, mustard, olive, and cream, with red finial brackets. As you can see from the current photo above, the bandstand has recently been repainted. This color may look good for wedding photographs, but I'm missing the original color scheme. Have you been to any of these parks which feature music-themed bandstands? Do you know of any others? 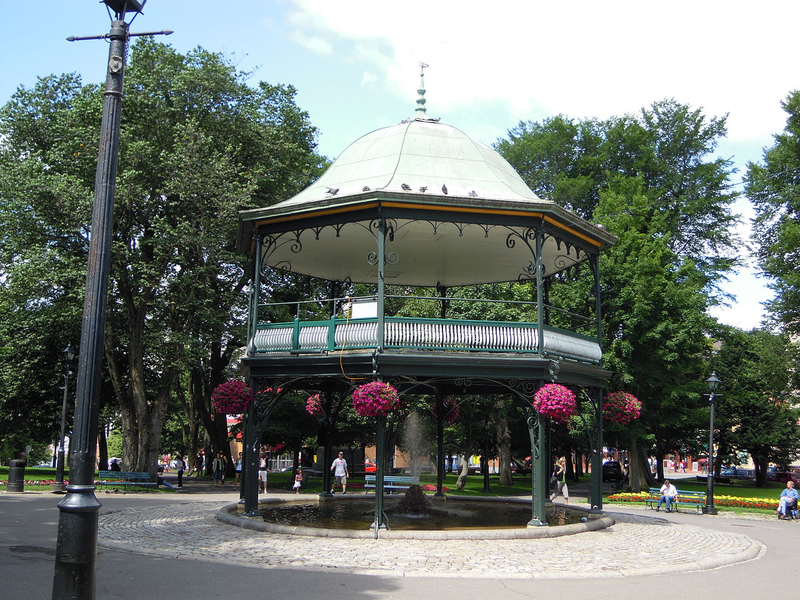 Are you surprised by the amount of money it takes to restore an ironwork bandstand? Care to share your thoughts? I've appreciated this series on bandstands. I've not seen any of the ones you have featured. I love "traveling" with the authors on this blog and seeing things I probably won't in real life. I used to live in St.Louis but never visited the bandstand. However I went to the botanical gardens near there. They have a gazebo type building there. My parents lived near the town of Oregon, Illinois. 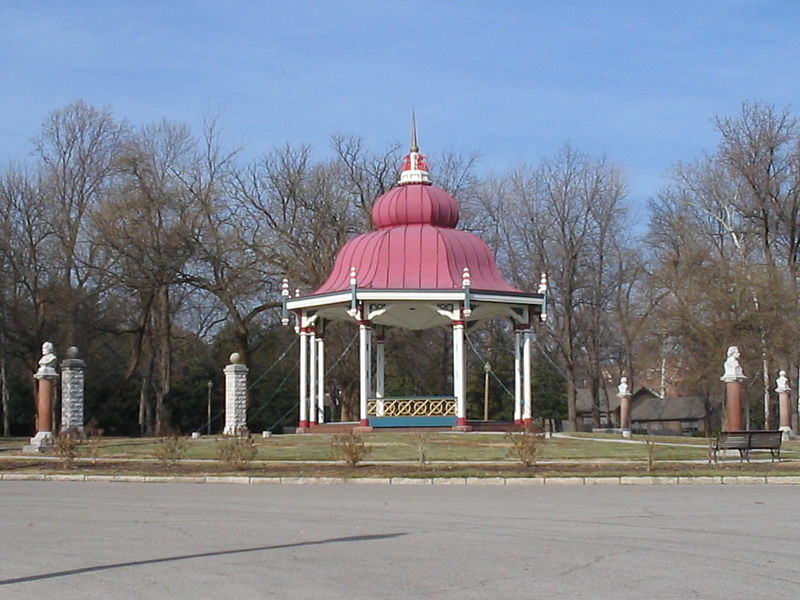 There is a bandstand in the square by the courthouse that is still in use today. The town used to have a publishing house and the workers formed the band long ago. Paula, while researching the bandstand series, images of beautiful botanical garden structures have inspired me. I'm aiming to start posting them the spring of 2019. I've read about a bandstand on the Oregon, Illinois courthouse grounds that used to have the police station on the lower level and a Sousa band on the the top, but that it was moved to the fairgrounds and is now used for offices. No mention was made of a publishing house or where the Sousa band members came from so I have no idea if this is the same one as you know, and I can't find any images of it. With an old image or two, it would make for a fascinating inclusion to this series.